So reading it this morning after weeks of actually forgetting it even exists (and prompting this post), I was wondering this basic question: does it feel empty, short, sad, in its final form? Mostly, no. It holds together, even though it feels very different from the genre of the other answers to the question (which I’m fine with). I’m proud of it. Here, in this blog post, I’ll tell you all about it, look at me, not ashamed. But the one thing that feels off: I’m not giving a lot of time/space here to my friend Ian Scarfe, who spend so much time on smart, long emails to me about these questions. He got cut a lot; in editing the piece, I edited him. And even with the distance of time, it’s hard for me to get a sense of if he sounds the way I want him to. Is he more of a soundbite, a quotable, a few links, then let’s move on to the other stuff? Or are there hints of the real human that speak up under my edit, the sounds of his piano drifting through the screen? Of course, I ask because of other projects: I’m editing a longer piece (the introduction to an edited collection), which currently means editing out a lot of the voices that I’ve collected. Where do those voices go after I hit delete? Where do their ideas go after I’ve stopped listening? Hoo boy. A few years back, I successfully disputed a file I legally uploaded to Soundcloud as part of my dissertation. And now, a file I uploaded around the same time is suddenly under investigation as well. Here’s the short version: for the diss, I was reading a lot of David Burrows, my favorite music philosopher, and I wanted to explore a quote of his in a brief audio experiment. He writes, “Seeing is like touching, hearing like being touched” (Sound, Speech, and Music 21). So (according to my memory, which is a little awkward because I can’t actually listen to the file I’m describing, and I haven’t for a few years) I recorded myself reading Burrows over and over, with various effects and musical elements added and removed to enact the ideas I was writing about those days: the ways music and sound’s meanings are embodied in the complete context of their delivery and in the experience of the listener. It was a way to put into practice my scholarship. It’s nothing fancy, just a playful file–but of course, when you’re doing scholarship on sound, it’s not just play; it’s play toward a critical end. Of course, it’s worth pointing out that Soundcloud has no problem with my use of the written Burrows quote, because the way we talk about and police short clips of writing is completely different from the way we talk about and police short clips of music. Sigh. After I clicked “some other reason,” Soundcloud gave a big list of things that it warned me wouldn’t be good enough answers–things like “I only used a small amount” or “I own the CD” (those aren’t actual quotes; I don’t have the page open anymore). The thing is, a lot of the things on its list are things that actually could help a fair use case, even if you acknowledge that they’re not sufficient defenses on their own. Here’s where Soundcloud and I agree: people really misunderstand the nature of fair use. I mean, that list could be useful for people who really think that having a single factor in their favor is good enough. But here’s where we differ: I think that walking people through real-world cases (say, when their upload is contested) is a way to teach them the way fair use actually works. I think that list could/should be given in the context of a fair use checklist, or links to successful fair use defenses people have used in the past, or even a short video on this stuff. Soundcloud disagrees / doesn’t have time / isn’t interested / whatever. I believe my use of this clip falls under fair use. I’ll walk through the 4 factors using the checklist at the Columbia Universities Libraries (https://copyright.columbia.edu/basics/fair-use/fair-use-checklist.html#Fair Use Checklist), after providing a short background. My use of the copyrighted clip was to help me and others explore this scholarly, critical concept (the question of how music is or isn’t “like being touched,” in Burrows’ words, especially when the background music and vocal delivery changes). I therefore believe my use of the copyrighted work counts as transformative under U.S. copyright law: I took music that was designed for entertainment purposes and digitally altered part of it, transforming it for a scholarly, critical purpose. This factor weighs in my favor. It’s true that the copyrighted work I used to help make my point was “highly creative work” (in the words of the fair use checklist I’m using). This factor weighs against me. Despite Soundcloud’s point that using a small amount of a copyrighted work doesn’t make the use more likely to be fair, “amount” is in fact one of the four fair use factors. (Yes, I know that people have been found liable for using very short amounts of music–but it’s still one of the four factors.) In this case, I used a very small amount of the copyrighted song. I don’t have a copy of my uploaded file on this computer, but I believe I used fewer than ten seconds of the song in question–not that ten seconds is a magic bullet, but that it’s a very small percentage of the overall song. This factor weighs in my favor. Though the four factors aren’t always weighed completely equally by judges, it’s common for fair use cases that actually go to court to decide in favor of the side that has the majority of the four factors in their favor. (See the cases listed by the federal government at http://www.copyright.gov/fair-use/fair-index.html for examples of many music cases.) Therefore, since three of the four factors weigh in my favor, I believe I have a genuine fair use to use this work in my piece. UPDATE (5/26/16): They agreed. That’s nice! Of her actual talk, not much. I remember liking her, and how her eyes thinned when she smiled. Worse yet, she couldn’t have spoken in the room I’m remembering (which is in Virginia, and I heard her speak at Rollins College, in Florida), and I don’t know who invited her or what she said. That’s all I remember from the event. That and a manila envelope she handed me at the end. In it: a short story I had typed and printed, her comments handwritten on it. But however uncertain I felt about this fiction class, the professor said I would be the one student whose writing would go to visiting author Mary Karr in advance, for her to read and comment on and deliver lovingly at the end of her reading, like a present. I had read The Liar’s Club and liked it (even though I definitely threw it across my dorm room at one point, but it was a sympathetic sort of throwing, a horror at what she went through, you have to believe me here), so I was pleased at being chosen, but I think I was also kind of confused and didn’t really get it. That is, it was a bigger deal to be chosen than I really realized at the time, but I was too wrapped up in how my stories weren’t very good to notice. The 90%: someone who was essentially me was talking to someone who was essentially a friend from high school in a fake cafe on a real road by a real marsh. We talked about why our mutual attraction never quite turned into anything beyond friendship and how her later relationships complicated it. The 10%: the cafe didn’t really exist, and neither did the conversation (at least not all at one time, with those words). I called the story “Marsh Land” at the last minute and hoped that its lack of meaningful action or change (one long conversation in one marshy cafe) would make it feel modern or something, like overlong dialogue from a Quentin Tarantino movie. What I remember from Karr’s feedback: only one thing: the moment, 3/4 of the way through the story, where I accidentally used “I” instead of “he” on a dialogue tag. She caught it, writing something like “A telling mistake?” in the margin. Mortified, I stuffed the manuscript back in the envelope. I never revised the story. Next fall, I’m teaching creative nonfiction for the third time, and we’re reading Karr–The Liar’s Club, of course, paired with her new The Art of Memoir. While I eat lunch in my office these days, so much like the office of my essay and fiction professors, I’m reading Lit, her third memoir, chapter by chapter, each little chunk now associated with the salad or sandwich I brought that day. So she’s on my mind a lot these days. And every time she shares something, here in her books, it has that feeling of a person honoring someone else with the truest meaning they have at their disposal, and I smile and nod in thanks, realizing that all I gave her was a cover-up, a not-quite-really-myself character who I couldn’t even bury as far as I thought I could, and I never even took her advice about how to make him work better. Honored to get a shout-out in this inspiring yelp of resistance–and glad they chose to include the Sabrepulse piece I suggested in the playlist. Happy 6th Blog-o-Versary Team SO! This year was tough, y’all. We know it. You know it. 2014-2015 was a year of rolling up sleeves, raging against the machine, typing furiously into the night, blocking the trolls, crying tears of frustration and anger, organizing heated meetings, fitting shoulders uncomfortably to various wheels while questioning exactly why and for whom, hugging our folks closer while unfriending Facebook “friends” like mofos, facing the millionth revision—or worse, the next police shooting, and the next and the next. A blog post about the anniversary of R.E.M.’s Green, because somehow this blog has become obsessed with R.E.M. That one above actually exists, even though you’re starting to wonder if any of these things actually exist, and I don’t blame you, how could anyone have this much that they haven’t finished, how could anyone be so much like cookies that just went into the oven? This one doesn’t exist, but I wish it did: a blog post on Pearl Jam and aggressiveness, chronicling how intimidated I was by their first album and how I forced myself to like it anyway and then how they slowly came to just seem like nice guys playing rock music but when did that happen I mean don’t you remember “IT’S . . . MY . . . BLOOOOOOOD!!! !” and all that from the second album? A personal essay about my youngest brother and our weird mutual aggression over our lives, if you can call it that, and I’m not sure you can, but don’t you think I should use the word aggression to echo #10 above? It’s not too often that you’re asked to review a book that entirely connects to the things you’ve been thinking about already lately, but that’s what happened here. Enjoy! Before I read F.M.R.L., I didn’t know Daniela Cascella or her work. I hadn’t read her first book or her blog or her Tweets; I hadn’t seen any exhibits she had curated or attended a reading. Instead, the words in her book introduced us. @kstedman @patchbaydoor Hey guys. I’m kind of having a thing right now with R.E.M. 's Up. Just thought you should know. So: one sentence about every song on Up (1998), released in the fall of my senior year of high school. Just because. Airportman: It’s like listening to Brian Eno in a construction zone, with that mechanical, robotic bass crunch cutting through the rest of the beautiful production–which I suppose Eno would probably find interesting. Lotus: I promise I would like this song without the faux-scream vocal doubling. Suspicion: A good example of why this album is better with headphones and the spaces they create, as you hear these little door slams from the building next door, the quiet strings in the basement, and the band crooning in a posh hotel ballroom. Hope: If these lyrics were published in a book of poetry I’d take a picture and post them on Facebook. At My Most Beautiful: I totally forgot about those “Eleanor Rigby”-style cellos crunching into the silence toward the end, and while I like the piano alright, I’d like to hear an all-cello version. The Apologist: I counted Michael singing “I’m sorry” or “so sorry” at least 23 times, and that doesn’t count the quiet echoed versions that just about double it; I think that’s a bit much. Sad Professor: Prettier and sadder than I remember it; in high school I always tried to decide if the really good part of this album started at this song or the next one, but I usually decided it was after this. 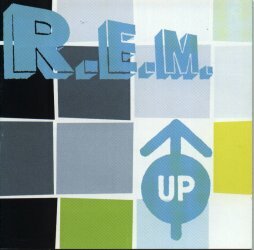 You’re in the Air: I put this on far too many mixtapes in 12th grade, mostly because most of my R.E.M. was on tape and I wanted CD quality on my mixes because a mix is serious business and this is the most obvious contender on the album for a mix oh I like it so much I mean listen to all that moody ambience (does this still count as one sentence?). Walk Unafraid: This is a song I’d like to hear on Song Exploder: what elements, exactly, add up to that that enveloping, escalating clump of sounds in the chorus? Why Not Smile: I don’t think it’s a real harpsichord, but is it a keyboard synthesizing a harpsichord sound or a guitar effect–and by asking this technical question am I ignoring the beauty of this song? Daysleeper: How did I never hear this as a carousing drinking song until today, or realize how much it sounds like it could have been on Automatic? I’m Not Over You: I have no memory of this little acoustic ditty living at the end of the “Diminished” track, which is weird given the number of times I listened to this CD in 1998. Parakeet: I always knew that the R.E.M.’s lyrics were a step above the rest, but this listen is reminding me how lovely and fresh they are on this album, and this track is a delightful example (if we ignore that “so sorry” business above). Falls to Climb: In a weird backward twist of history, this song would sound nice as an 80s synthpop remix–maybe Chvrches can cover it?